All of the Asian flavors you love, in less than 10 minutes of time! 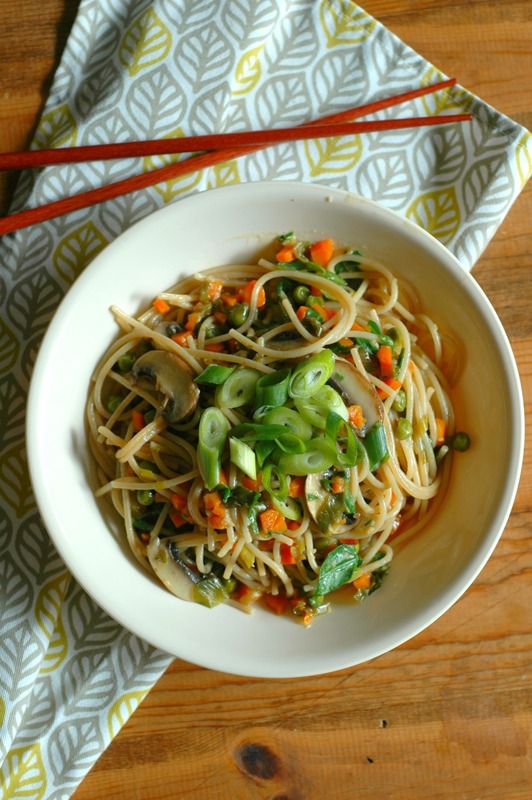 This healthy Asian Lo Mein is weeknight fast and nourishing at the same time! Our school year is off and running, and I feel like we did just that for the first week…Run! We are still getting our feet wet back into the groove of early mornings and school after a laid back summer break, so I have been perfecting some of my quicker weeknight meals. While we don’t have a lot of extra-curricular activities after school yet with such little ones, I *do* have a brand new kindergartener getting used to full days of school (read – tired! ), a toddler that has to get woken up on occasion from naps for school pick up (read – crabby! ), and a 2nd grader that wants to get her project done *right now* (read – busy!). It just helps to have a dinner that doesn’t require a lot of hands on time. I am coming up on my 1 year anniversary of having my Instant Pot and I feel like this summer we really got to know each other! I had been using it mainly to make whole chickens and bone broth up until this summer, and boy I am really loving figuring out how to use it for more than just that. As much as I love cooking, there really are more days in the week that I need fast meals than ones that I don’t. If there is room on the birthday or Christmas list this year, an Instant Pot is definitely one I would try to fit in! 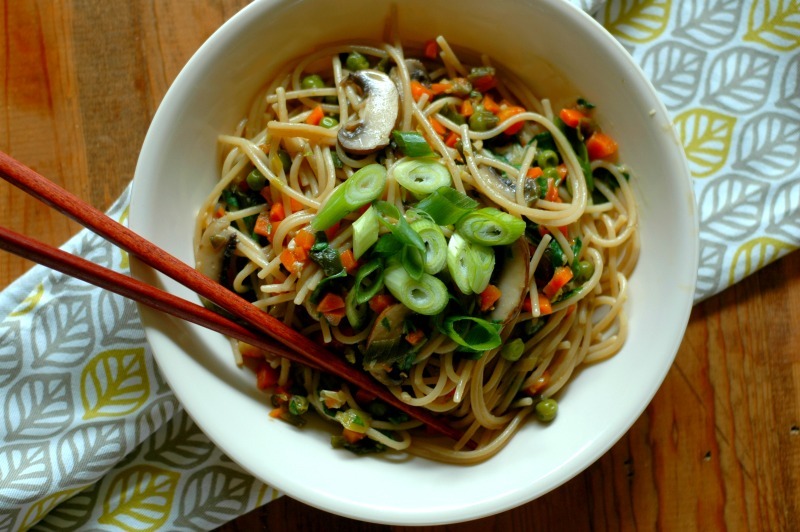 This quick Lo Mein has every flavor burst you love about Asian food in a “dump it all in” style of cooking! I have even done the 5 minutes of veggie chopping the night before and set it in the fridge until dinner the next day so it literally can just be a “dump it all in” meal! Salty, sweet, and savory all in one bite, the kids will not only be in love with *all* the noodles, but it just plain tastes amazing! And you can feel good about getting the veggies in! A quick note on how you can change it up and add variety! 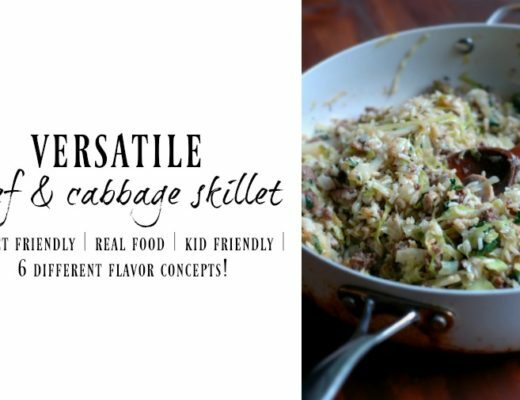 While this is definitely a filling meal for how my family eats as it is, you can certainly add some chopped beef, chicken, or fish. I usually have leftovers topped with a fried egg the next morning and it is pretty much amazing (scrambling an egg into it would work fine too)! 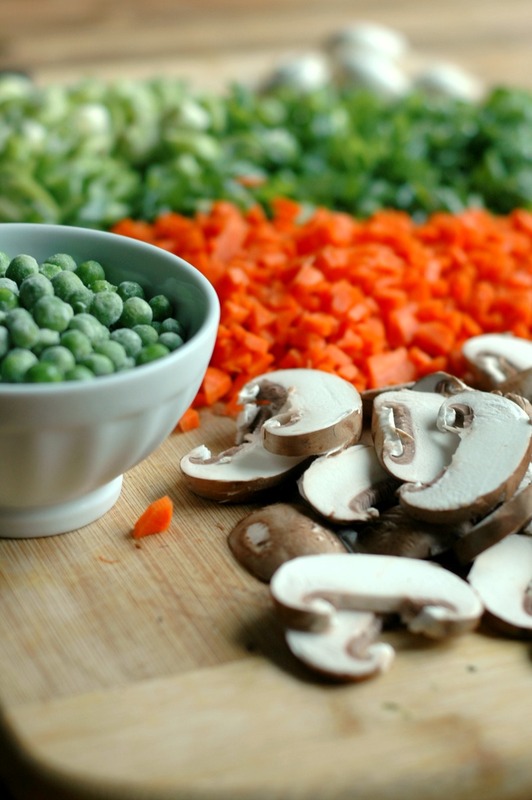 The veggies are pretty interchangeable as well – use whatever you have on hand. I have swapped the spinach for chopped kale if that is what I have, or used fresh broccoli instead of peas. 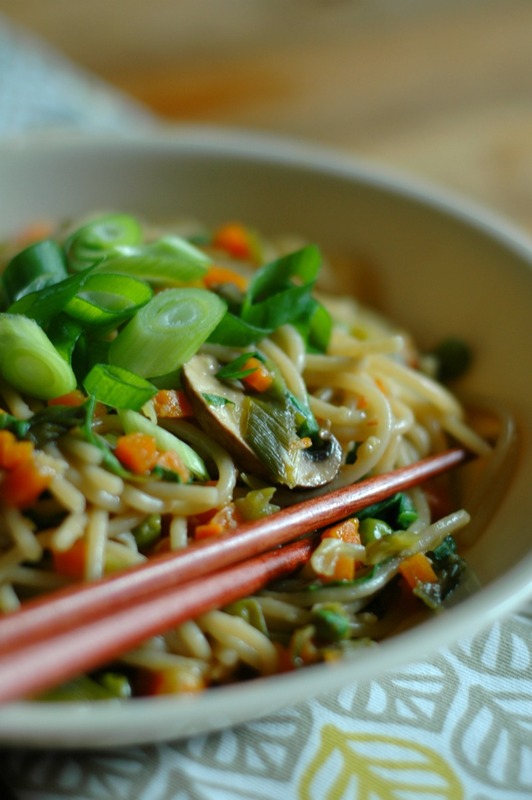 You can also add more bone broth and make it more of a Lo Mein soup. I have found a rich beef broth tastes so good! Also, don’t forget to pack the leftovers up in the school lunch thermos! Just add a splash of water or broth to warm it up in the morning and put it in a thermos to go! There are more details on how to temper your thermos and keep food warm for school in this post. 2 cups bone broth a rich beef broth works best. You can do bone broth in the Instant Pot too ! 1/4 tsp red pepper flakes this leaves a kid friendly, mild heat - if you like more kick add more! Everything except the spinach into the Instant Pot, stir to combine and seal the lid. Be sure the valve is closed. Turn your IP on, press manual, and then use the (+/-) button to press the time down to 2 minutes. The Instant Pot will turn "ON" and come to pressure before it counts down the 2 minutes. When the 2 minutes is done, turn the Instant Pot "OFF", and set a timer for 4 minutes to let the pot naturally release some of the pressure and finish cooking the noodles through. After the 4 minutes, release the rest of the pressure, take the lid off, and stir in the fresh spinach to combine. There will be a little bit of liquid in the bottom that will continue to soak up into the noodles and the starch from the noodles will make it "saucy". Serve topped with sliced green onion or chopped nuts. 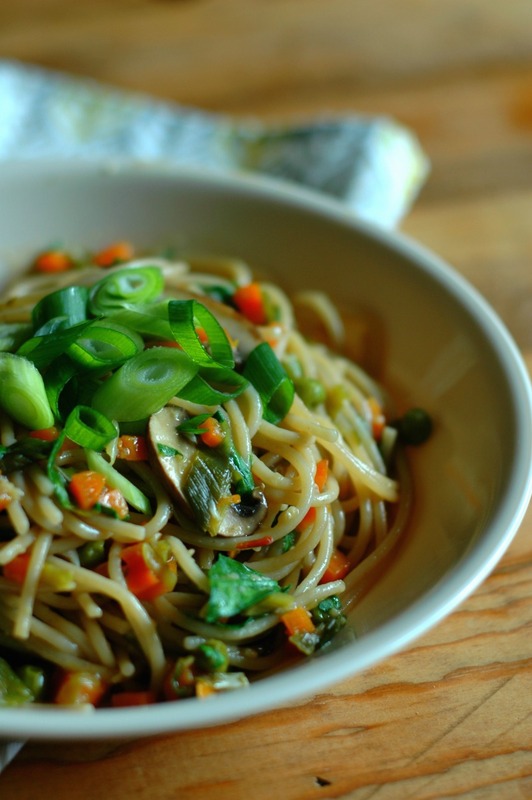 This recipe gives the noodle a good, “al dente” texture in cook time for me. Not too mushy and not hard! It is just perfect! I have, however, found that sometimes when I have tried other people’s Instant Pot recipes that cook times for noodles, rice, even hard boiled eggs can vary. For instance the “6-6-6” method for hard boiled eggs leaves my eggs really overdone – I have to cook at 5 minutes on low pressure! I’m actually not sure why this is (please chime in if you know! ), but keep that in mind. If you open the lid and your noodles need a bit more cook time, simply turn the saute button on and let them cook a little longer. I will try to answer your IP questions as best as I can, but please remember I am fairly new to using it myself – thank you for understanding! 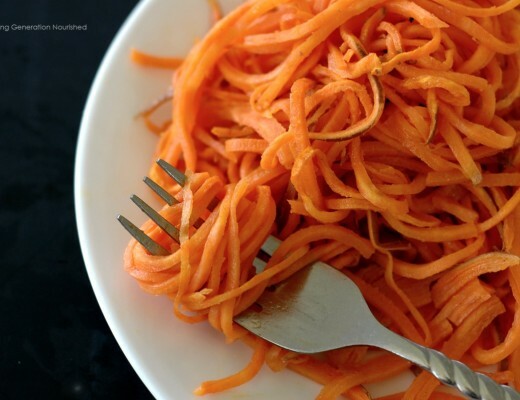 The Best Way To Spirilize & Cook Sweet Potatoes! I LOVE this recipe Renee! I’ve got my IP going today too. I’m going to have to try this soon. I think my family would love this. I hope you get to enjoy it soon Emily! 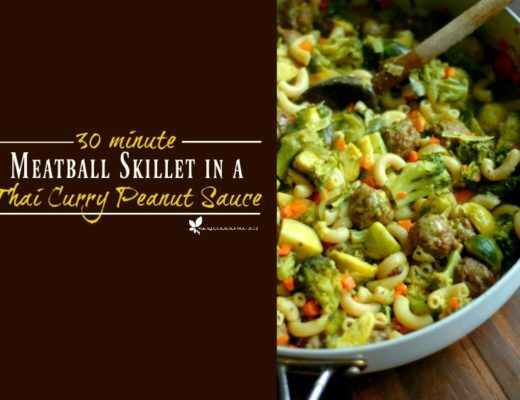 Love everything about this recipe and your explanations! I have only had my IP for one month and love it. But I haven’t tried noodles yet, and of course we all love Asian flavors! Thank you, excited to make this! Just made this & Yum! Thank u! Sounds perfect Meg! I have found that I need to play around with IP times when I’m following other recipes too – I feel like mine runs hotter for some reason and I don’t need as much cook time – do you find that? I am still fairly new to the IP and still learning along the way! How many does this serve? I think this sounds delicious for a church New Year’s Day potluck, and so easy to turn on and cook in between the services and time to eat. I’ll prep it before church and have it ready to go (except the noodles), then start it up as soon as church is over. Hot and fresh! I’m just curious if it is enough for 10-12 to have a small helping or if I can double it in my 6qt Instant Pot. What do you think? Hi Sarah! What a fun idea! I have th 7 in 1 pot and it fills it up about 3/4 of the way and feeds my family for a couple dinners – I would say you should be good! If you added chicken to this, do you know what the IP directions would be? TIA! Hi Kate! If the chicken is cooked I would just add it in with the pasta and cook as usual. If the chicken isn’t cooked, you could saute it at the bottom of the IP and then cook as usual! My noodles keep getting clumped together while they cook. Any suggestions? Hi Bekah! What kind of noodles are you using? Do you stir the noodles around a bit before putting the lid on? Hi Bekah! Next time break the noodles in half and set them in the liquid first before all the veg! I’ll have to go back and make that more clear in the instructions! Thank you! Same thing happened to me…Since the recipe says to put EVERYTHING in the pot, I just put it all in in the order the ingredients are listed, and the noodles are very last on the list. Half were overdone, and half were totally raw. The veggies on the bottom were soggy and bloated. 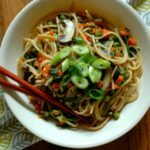 I think this could have turned out better if the recipe was a little more specific–also, it would help to specify what thickness of noodles are best to use, for beginners like me who haven’t cooked rice/gluten free noodles before. I used really thin ones, and I don’t know if that was best. Altitude makes a big difference. I live at almost 9000 feet, so I have to cook things for a longer time. Adding 5% for every 1000 feet over 2000 feet is a place to start. Thank you for that tip Elizabeth! I know that I live right at sea level where we are so that is helpful. I wonder about using Lo Mein noodles….. This came up on my Facebook feed this morning, so I made it tonight for dinner. It was very good! Our noodles came out a bit crunchy; next time I’ll make sure they go into the pot with the beef broth, before the veggies. And ours was Very Salty. I used soy sauce instead of Coconut Aminos, and added the 1 tsp of salt in the recipe. Next time I’ll use soy sauce and omit the salt. Thanks for the recipe. I’d never had Lo Mein before. Hi Jennifer! Yes it does help to get the noodles right down in the liquid. Thank you for the tip on how to swap for the soy sauce if someone wishes to do that! This did not work for us. Some of the noodles were dry, untouched by the broth, and others completely disintegrated upon touching, overcooked beyond oblivion. Hi Christopher! That’s too bad! I make this all the time without issues. If you decide to try it again, be sure the noodles are stirred in well. Also, I am finding that some IP’s just run hotter or cook faster than others. I have made certain recipes from others that seemed overcooked or undercooked and have had to play around with the times. One example would be with hard boiled eggs. The typical recipe for hard boiled eggs is 6 minutes then 6 minutes natural pressure release and then 6 minutes in the cold water – this leaves my eggs extremely over cooked. I have to pull my pressure down to low and only cook for 4 minutes to get a good hard boiled egg. In the last couple years of using the Instant Pot I’m just finding cook times to be variable. I hope that helps some. Wondering if I substitute Bok Choy for the spinach, should I still add it in later? Thanks! Hi Jennifer! Yes that should work! I would put it in to pressure cook with the rest of the meal though – the spinach just needs to wilt in and the bok choy will need a bit longer I’m thinking. Made this for dinner tonight after frantically googling “veggie noodle instant pot”. It was delicious !! I used tamari since I didn’t have any coconut aminos in the pantry. Baby, toddler, spouse and I loved it! Thank you ! I will be filing this one away for future uses. That’s great Cindy! I love it when you can add a new item to the menu rotation! Awesome! Glad you enjoyed it Michael! So if I don’t have money for coconut amigos how much more soysauce use should I add??? It should be a pretty equal swap Misty! This recipe sounds delicious. I would like to try this with zoodles (zucchini noodles) instead of rice noodles. Any idea when the best time to add the zoodles? Hi Ann! Acutally, I would just toss some sea salt on the zoodles in a strainer and let all the water come out of them and just toss them into the cooked soup. You will want to take out some of the broth as some of that is for the pasta to absorb and it will be too much broth with the zoodles. Unfortunately half my noodles cooked and the other half was hard and clumpy. I think they were not covered enough.. I think next time I will try breaking in half and using whole wheat pasta. Was happy to see a recipe that was oil free! This recipe sounds wonderful.! Do you think I could use soba noodles? Hi Susan! I’ve never used soba noodles before, so I’m not sure on the cook time! Do the green onions cook or just get used for topping ? Or both? I don’t have a manual setting on my Instapot 6 duo?! Hi Peg! The Manual button on the Instant Pot 6 duo is right below the pressure button. Made this tonight and it was AMAZING! Glad I read the comments about breaking the noodles and putting them in the broth. I opted to buy a Crock-pot Express Cooker because of Consumer report ratings so I had it loaded and went to try to set 2 minutes and was a little confused. Had to choose a pre-set of Rice/Risotto and then deduct time down to 3 minutes (that’s as far down as that -or any other setting- would go). So I just watched it and when it counted down to 1 min I turned it off and finished the recipe as stated. It was perfect! Question. Could you do this as a slow cooker recipe? If so how long and what setting would you recommend? Hi Cami! I’m thinking slow cooker method would make the noodles too mushy? Do you think I could swap the bone broth for veggie broth and make this a vegan recipe? That would be fine Katie! Just made this – delicious! I put the noodles in first & set my timer for 4 mins instead of 2. Everything else was by the book.